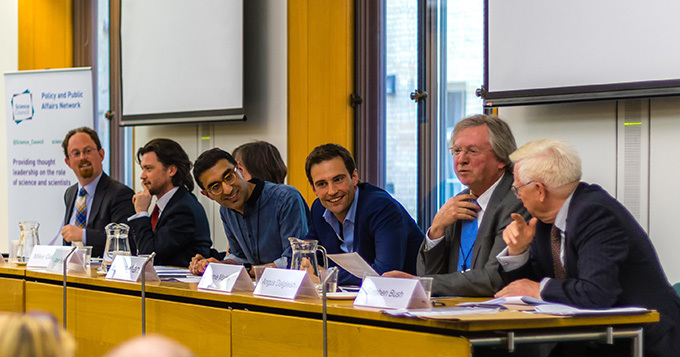 Last night, the Science Council hosted the first debate between the two official lead campaigns for the EU referendum, on the subject ‘UK Science Doesn’t Need the European Union’. According to the exit poll of attendees, the resounding conclusion was that it does. However both sides agreed that for UK science to flourish we need to be able to collaborate beyond our own borders. There was heated discussion over whether the UK could still access Horizon 2020 funding from outside the EU, while the lack of detail over what a post-Brexit world might look like for UK science became a point of contention for both sides, and the audience. On the side of Britain Stronger in Europe was Professor Janet Beer, Vice Chancellor of University of Liverpool, Dr Julian Huppert, former MP for Cambridge and Dr Mike Galsworthy from Scientists for EU. Their argument was that we shouldn’t risk an uncertain future. “Why would you jump out of a plane and then find out if you are going to be given a parachute?” asked Julian Huppert. Audience questions ranged from issues of transferability of professional qualifications and registration, to the lack of contingency planning for science in the case of a win for Leave. Emran Mian, Director of the Social Market Foundation, chaired the debate confidently and efficiently, although he declined to say which way he had voted. The Times Higher Education also provides a summary of the debate. Read what happened on our Storify feed, and continue the conversation with us at @science_council using the hashtag #EUref.